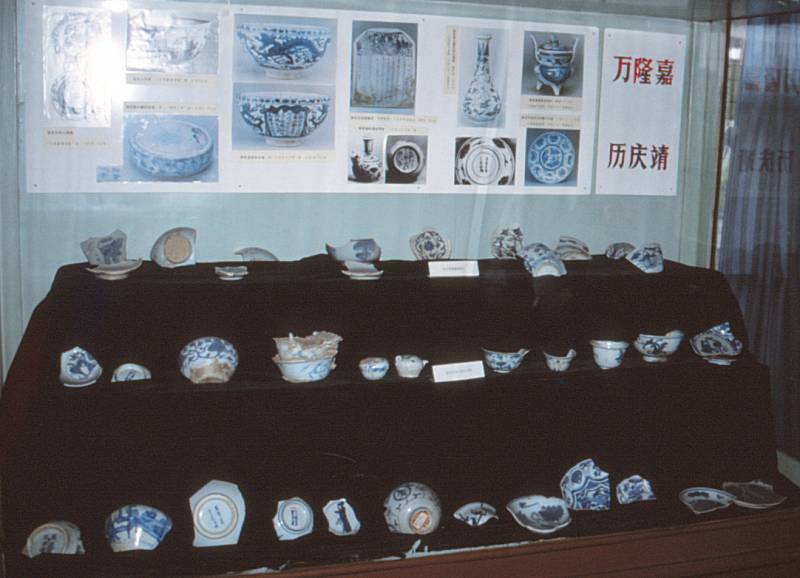 The Porcelain Exhibition Hall in Jingdezhen. On the third floor are twelve show cases of Minyao. Photo © Jan-Erik Nilsson, Jingdezhen 9 Sept 1992. We were again back in Jingdezhen. 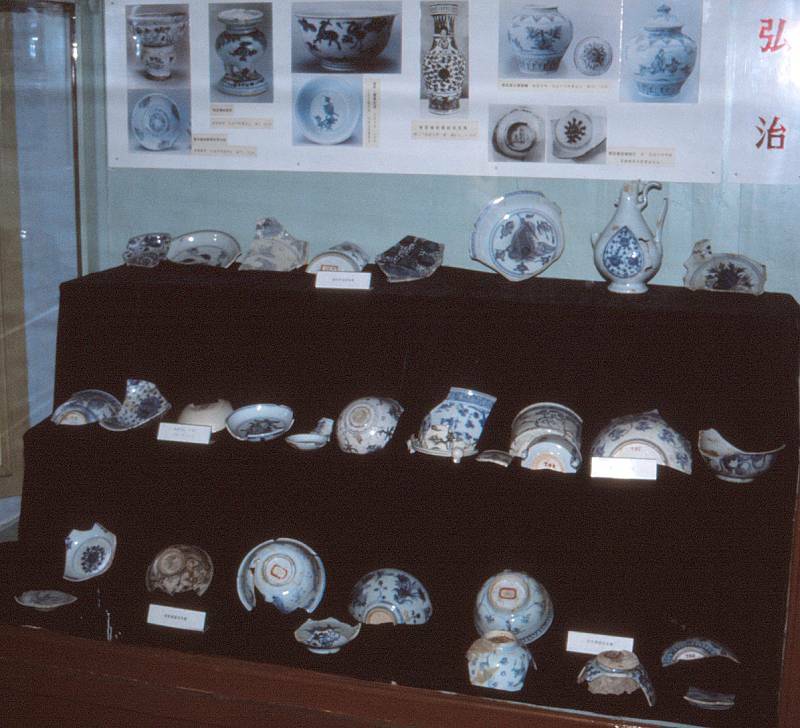 A few years ago, The Porcelain Exhibition Hall was the Official Porcelain Museum of Jingdezhen, today it is more of a study collection and an exhibition of what has been produced in Jingdezhen through the ages with a heavy emphasis on modern production. In the entrance section of the building there is a showroom occupying three floors. Behind this building is a fairly large studio we understood as dedicated to production of replicas of antique porcelain. The assumption here is that these replicas are made for exhibition purposes. There is an ambition in China to build provincial museums everywhere for the education of the people. In all likelihood the number of genuine objects are insufficient to supply all these museums so, I understood this more or less as China's official factory for museum replicas. "They are making much better copies here than in Beijing", they said. All exhibited pottery here is called Minyao, meaning the People's Wares, in the sense of that this porcelain have been made at private kilns and for the use by ordinary people. 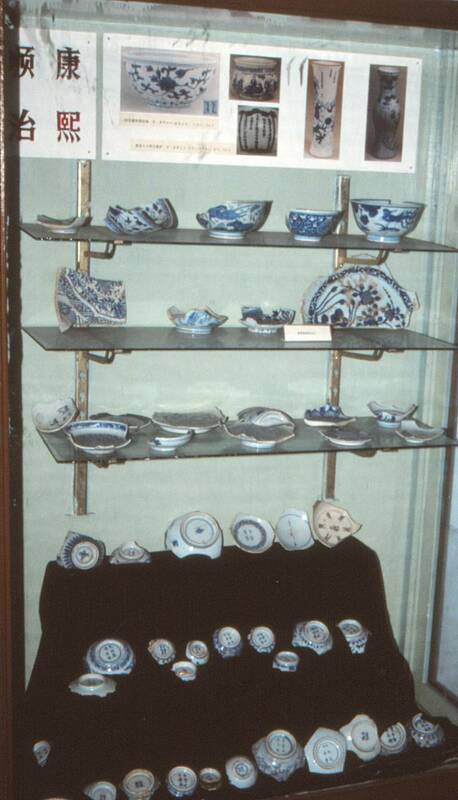 All the Chinese export porcelain which came to Europe during the 1700s is also Minyao. The wares made for the emperor is called Guanyao meaning official wares made for the emperor. The third floor contains 12 showcases (1-8 counterclockwise from the door) including four with glass upwards on the middle of the floor (numbered 9-12). 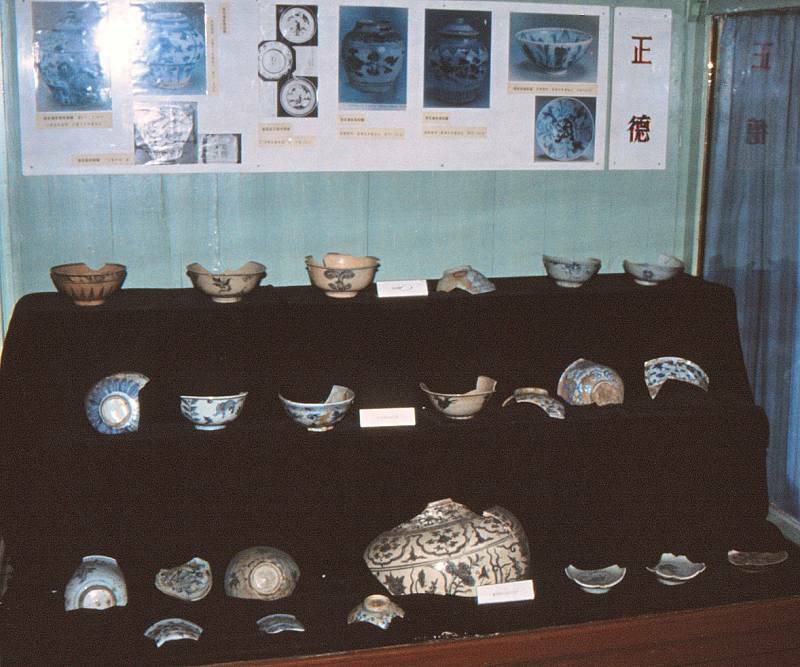 The display cases contain excavated fragments and objects. Some are dated, others are identified in terms of where they were found. Two things we can observe directly. No one here knows where the porcelain exported to Europe were manufactured. Neither does anyone here know where the Kraak - porcelain was manufactured. They have found loose shards but no kilns. Shelf 1 - Hungwu - Zhengde / Yaoli / Fish, horse, flower. Here were made bowls and platters. Shelf 2-3 - Hutian / Yaoli. Fish patterns. East River (Dong he) has very high quality. Shelf 4 - Luomaqiao at the floating bridge / Excavated at San Jia Lu / excavated at Qin Hua publishing house. Shelf 5 - Lian Se Lu / Hutian. The finds from San Jia Lu included a red and green enameled shard, but only one was found. Shards from the three Interregnum emperors Zhengtong (1436-49), Jingtai (1450-57) and Tianshun (1457-64). 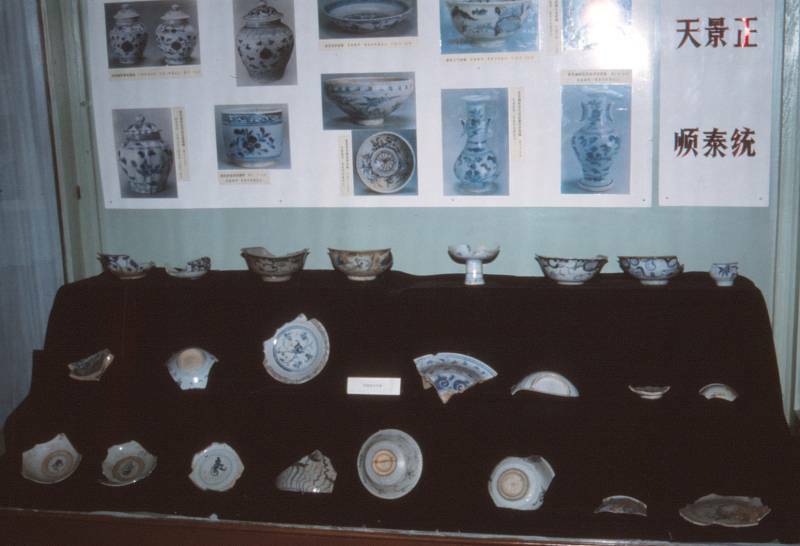 "Due to political reasons no Imperial porcelain were ordered during this period", (however some Imperial wares seems to exist even if they are few). Everything in this cabinet is from Yaoli. Everything from Donghe looks the same. One cannot say that it was exactly at Yaoli they made the best porcelain, but Yaoli was the largest, so then quite a few should have been good." Uppermost shelf - Shibadu (the 18th ford). During Hongzhi (1488-1505) animal, kylin, and birds become more common. Here is also a flagon of the kind we are familiar with having a Portuguese Crest. Bottom shelf : Guan Yin Ge and to the right Bai Sui Tang. This cabinet contains a pretty straightforward 'kraak' shard in the right part of the bottom shelf. The sign board says from top to bottom, right to left, Jiaqing (1522-1566), Longqing (1567-1572), Wanli (1573-1620). The most interesting here is perhaps one Kraak shard. The notion here is that Kraak porcelain is a Jingdezhen ware, but no one knows where it may have been made. The shard in the cabinet is as far as it is known here a lose find. 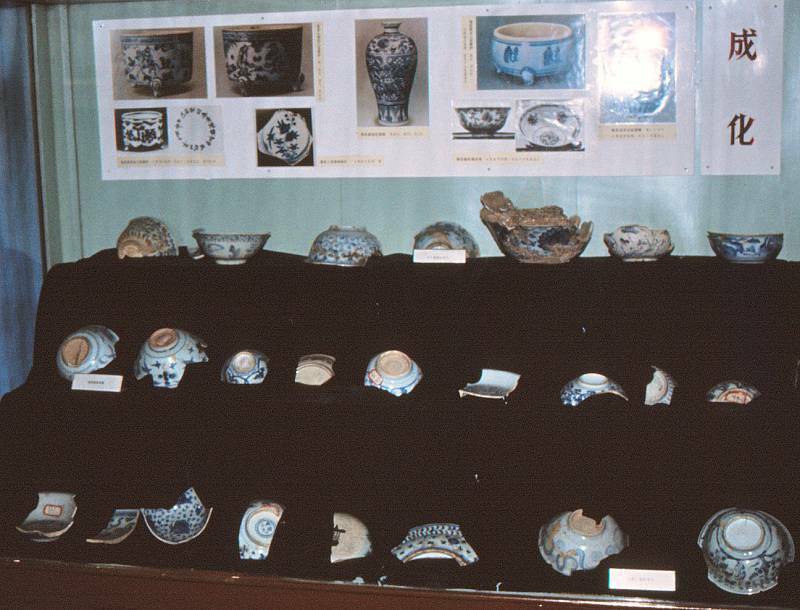 Second and third shelf from the top: Findings from Bai Sui Tang. Bottom shelf: Findings from Sen Jia Lu. 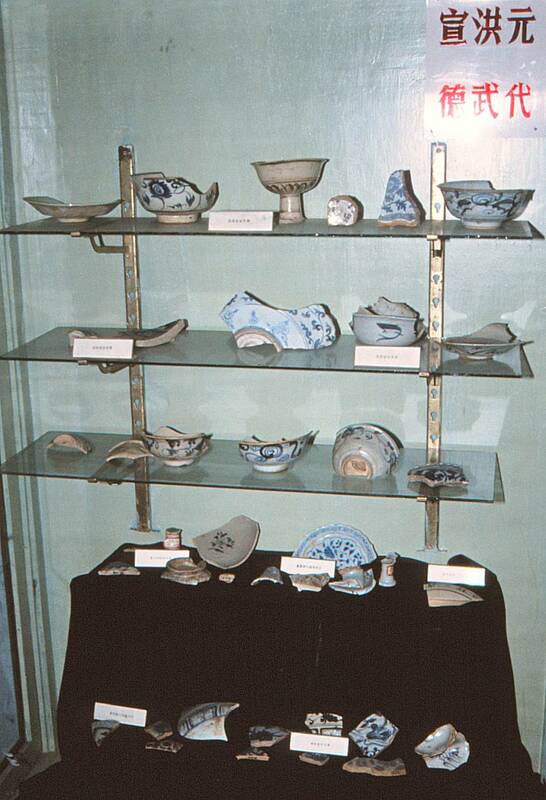 Uppermost shelf: finds from Huazi kiln in the Leping area (1 hour drive from Jingdezhen). Second and third shelf from the top: Loose findings from the construction of Jing Hao Publishing house. One observation is that marks occur inside the bowls while bases are left unglazed. On the second shelf from the top, I have written in my notes, "Guan yin ge" street. 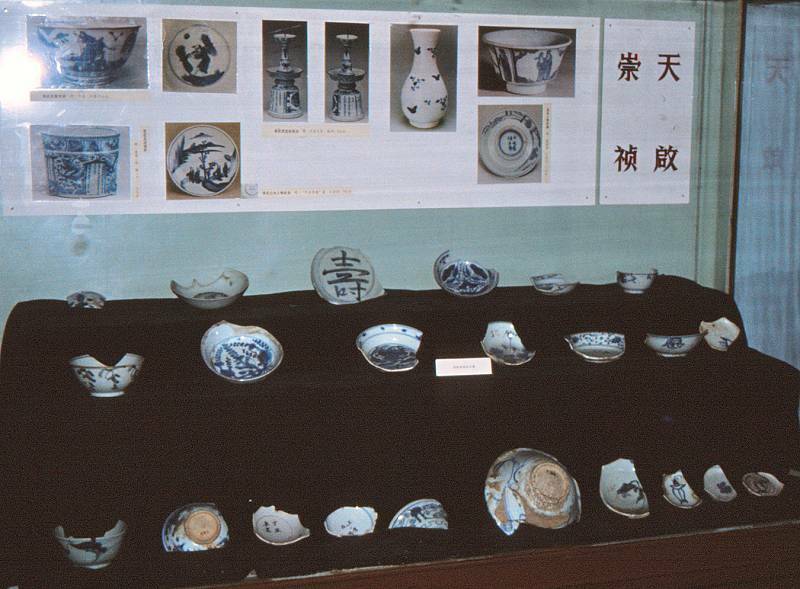 The pieces was commented with that the export to Japan begun during Jiajing (1522-66). Bowls for Japan often had lower sides than those for China. Show case 8. Shunzhi (1644-1661) and Kangxi (1662-1722). A large number of these shards have reign marks despite being minyao. Contains items dated to the Shunzhi (1644-1661) and Kangxi (1662-1722) period. The second and third shelf is according to my notes loose finds from Liang Shu Ju, Rice Bureau. One dish is decorated with a leaf and a text. The text reads "When the Wo Tong leaves are falling people know that the autumn is coming." 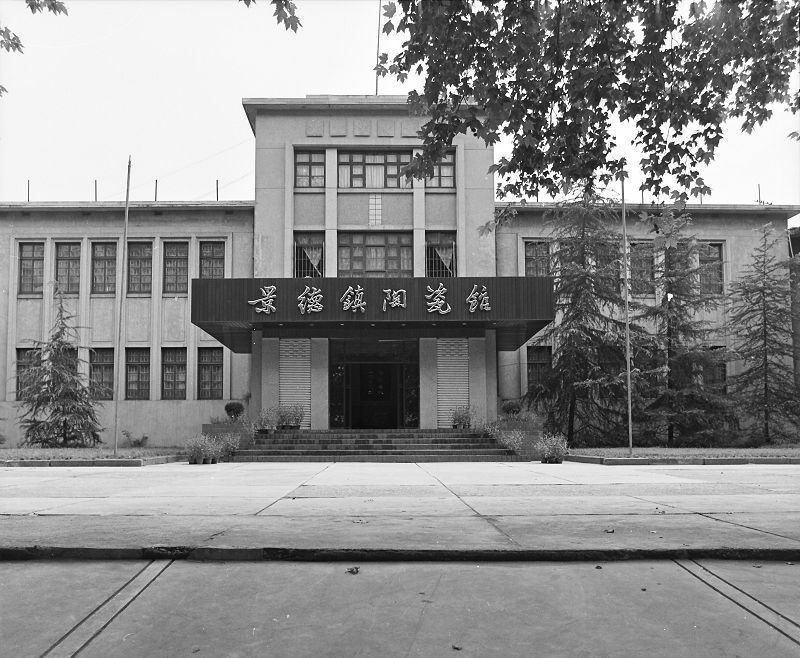 Export goods were called "wen zhang", for western kiln. Show case 9. Flowers and birds. Types of decoration, mainly late Ming/Wanli (1573-1620). Intended to shows various decorations, to decorators and painters. Erik Engel comparing maps. There is a great variety on what information that is available on different maps so to the best of our ability we try to compile just one map with all informations which of course does not work. The fact that the different maps put the same thing of different places are not helping. The day begun with rest and reflections. During the afternoon, we would look at the shard exhibition in The Porcelain Exhibition Hall and tomorrow at 8AM we would visit Hutian. Bo wasn't feeling all that well today so we decided he would remain at the Hotel while we went back to the Porcelain Hall. I brought one of the porcelain tureens I had got from Hackman-Rörstrand as a gift and asked Bo for a few of his business card. All good things come in threes, said Bo and handed me a bundle. In the entrance some animated conversation appeared to be going on between our archaeologist friends and the Museum representatives at hand. I asked if it was possible to meet with the manager and that our professor who unfortunately was sick at the Hotel, had asked us to forward his greetings, and a small gift. We were then brought to the building's courtyard, a nice park-like area planted with shrubs, trees and paved walk ways, and into the large reception hall. It was one of those typical official lounges with armchairs, lace tablecloths and small tables along the walls. I placed myself in the middle of the long wall and left the formal head seat of honor in the middle of the short side to our hosts. We were then served tea in those Chinese tea mugs with lids that initially feels quite awkward but you miss once you are back home in Sweden. We were then told that one of their professors was being called in and that he would soon be with us. After a proper exchange of politeness's, explanations and greetings we told about the ongoing exhibition in Shanghai and how we all were part in a cultural exchange effort, us coming here to study porcelain. The Hackman-Rörstrand Ostindia pattern tureen was presented as an example of how we after having learnt the Chinese art of porcelain making now had come back to show them the modest result of our efforts, and also to commemorate 260 years of peaceful trade relations between Sweden and China. We were promptly each given a newly made blue and white vase in Yuan-style in return, after which they began to inquire closer about the purpose of our visit. I am not sure how much that got lost in the translation but the porcelain exhibition would be opened for us as soon as the cleaners were done, which would just take a little while. We then spent a pleasant afternoon among the cabinets, made thorough notes and finally invited everybody around to a dinner buffet in the evening at our Hotel. We politely declined an offer to be driven back home by their staff. On our way out we also got to see a large exhibition of excellent studio ceramics. 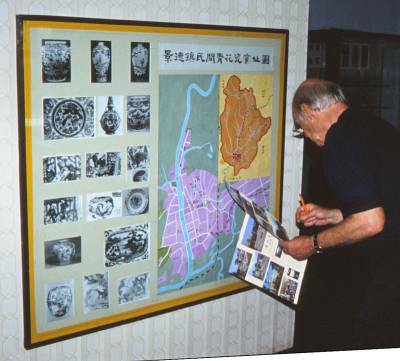 Mr. Zhang, an Executive Board member and artist who is also the author of an article in Jingdezhen Ceramics 1986:3 showed us around. Our friends the archaeologists showed a becoming restraint in their comments on the authenticity of the more rare objects in the main exhibition. In the evening we met for the banquet at our Hotel. We donated a genuine 18th century blue and white Chinese export porcelain plate to the Museum. They were surprised bordering to disbelief that this kind of pieces had been made in China but we ensured them that this was the case. It came from within walking distance from where we sat, that much we knew. But ultimately I was curious if they knew exactly where the export kilns had been located and in this way I could really make sure that this was not known. I had asked a similar question one year earlier to other academics and specialists, and got the same surprised looks back. Eventually we were welcomed to come re-visit their exhibition any time we wanted, we could take as many photographs that we wanted, and were also invited to come see their ceramic workshop where they made the best antique replicas in China. During this and previous occasions I and Bo had discussed how it could be possible to suddenly gear up and within reasonable time deliver such large quantities of porcelain that the Emperor ordered. For example the 443 500 objects that was ordered in 1433. During our dinner I brought this question up with the people from the Porcelain Exhibition Hall. They confirmed immediately that the majority of these private orders were Minyao. Guanyao, for imperial use, was complicated to make and took a long time to decorate. The imperial factory area was also too small and the number of kilns was not enough, so the majority of these gigantic orders should have been produced at private kilns like the ones at the Raonan that we had visited the previous day. If an oven is set up for a particular order, it is likely that it is closed down when delivery is complete. Yu and Zheng have also stated that each kiln only makes a few specific shapes. During the evening, we discussed how different firing saggars were made and used. My interest was to know if one could estimate the amount of waste that was produced for a specific amount of porcelain. For example how many pieces would have been made for any cubic meter of ceramic waste left at the kiln site? In this something as esoteric as clay shrinkage during firing is crucial. No definite answer could be given by the Chinese people we have talked to so far. It is fun. In general any Chinese businessman I have met with have been at least as easy to do business with as any western person I know, and this with very few words in common between the two of us. It feels like the main concern is to take enough time to discuss what you want. The problem might also be that so far, Chinese people in general might not have met so many Westerners. If you are out on the country side you might well be the first foreigner the ones you talk to have ever met. I think he might simply not know what to expect. If he get 200 Swedish crowns in salary or pocket money a month, maybe 200 USD seems just as reasonable as 20 USD when he shall ask for a price. Within the circles I have been in China, it is a matter of courtesy not to joke about money. The satisfaction in arriving at the "right price" is a way of showing each other mutual respect and is a lot more important than the deal itself. You can be absolutely assured that you are not getting to buy anything too cheap. You can however be rude by rushing the deal and end up paying too much.